Silver Samurai (Kenuichio Harada) is the name of two characters in Marvel Comics. 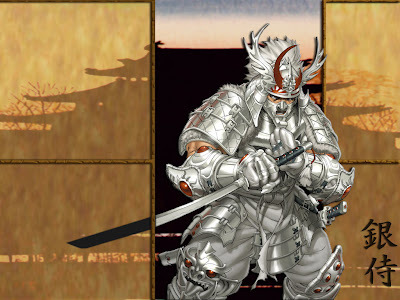 More about Silver Samurai Character Review...Keep reading ! The first Silver Samurai is a mutant with the ability to generate a tachyon field, with which he can surround anything. He commonly uses his power on his sword, enabling it to cut through nearly anything, except adamantium. When working with the Viper, he possesses a teleportation ring, which allows him to teleport from one location to another, granting him great mobility and stealth. As a self-styled samurai, he is a master of Kenjutsu (katana), and a martial arts master specializing in edged weapons, hand to hand combat, and tactics. He usually wears a suit of lightweight steel alloy body armor, modeled after traditional samurai armor, but made of modern protective materials. He carries a katana (long sword), shuriken (throwing stars), and other weaponry. Keniuchio has extensive knowledge of the operations of criminal organizations due to his shady past, which he now uses in the service of his government to combat such organizations. He is an expert in the history and customs of the samurai class (Bushido). The second Silver Samurai possesses a technologically-advanced suit of armor, which grants him the ability of flight and protection from many conventional attacks. In addition to carrying two katana blades, Shingen possesses a number of armaments and gadgets, such an energy cannon built into the right wrist of the suit.. In the film X2, his name appears on a list of names Mystique scrolls through on Stryker's computer while looking for Magneto's file. In the featurette "Wolverine Unleashed: The Complete Origins", on the DVD release of X-Men Origins: Wolverine, the producer Lauren Shuler Donner reveals that 20th Century Fox has approved the making of a stand alone Wolverine movie focusing on the Silver Samurai, and Wolverine's time in Japan. Hugh Jackman, who plays Wolverine in the X-Men films confirmed that Silver Samurai will be the main antagonist in the upcoming film The Wolverine. Will Yun Lee is cast as Silver Samurai.